The little one got a plain-jane raglan from the Mega Max pattern from Max & Meena (which doesn't do the pattern justice, consider the 100s of options the pattern supplies!). My oldee two boys practically live in Mega Max Raglans. This is the first one I sewed up for the little man. And I loved that plaid so much, that I had to make this little paci clip as well! 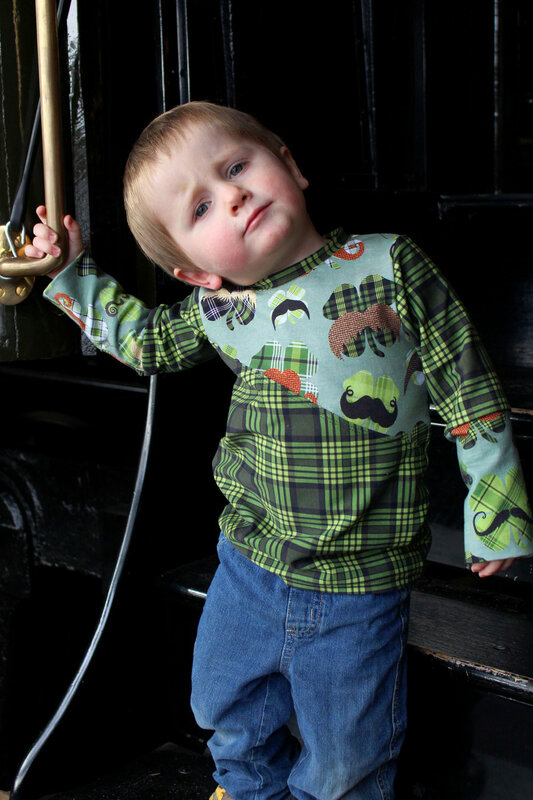 This is the Isaiah Plaid, but Vintage Lace also has two other coordinating plaids for the shamrock prints! Roman got an Elliedactyl Ried for his shirt. I love the assymetry. Is he extra stinkin' adorable, or what? I had to do some serious strategic-planning to get all the pieces for all three boys' shirts from these cuts of cotton Lycra, so I ended up using the tall cuffs on Roman's arms. It's not an option I would usually use, but I really like how it turned out! This is another pattern that has a TON of options. There's an additional scoop option for the main body, some cool sleeve color blocking options, and a color-blocked hood. This one that I made is actually almost as simple as you can get it, haha! I took the boys to the train museum to take these pictures-- they loved the excuse to go see the trains, and I know we all loved not standing out in the cold, haha. Grant's shirt is the Edi, from a German designer, Lolletroll. I got it on Makerist. As I don't speak German, I couldn't tell you a whole lot about the designer or the pattern. Just that I'm managing to sew a little more German designers lately, thanks to Google translate, haha. I do find this hood to be on the smaller side, if you have a kid that actually wants to wear the hood up (this kid definitely likes to wear his hood up). I did let the boys play a little bit . . . after their work was done ;) Grant is starting to take this model-for-mom thing pretty seriously. It's making it more fun to sew for him! Whether you have a wee bit of Irish in you or not, head over to Vintage Lace to check out all their spring prints! They have a little bit over everything-- Easter, St Patrick's Day, florals (see mine here! ), and even a few sports thrown into the mix. I can't wait to have all THREE of my boys sport these, come St Paddy's Day!